My first associations with the music of George Lloyd were conducted by the man himself. In 1986, I was in the small invited audience for radio broadcasts of two concerts of Lloyd conducting his own music with BBC Philharmonic Orchestra at Studio 7 in the now demolished New Broadcasting House, Manchester. I have the Gestetnered sheet from one of those concerts in which Lloyd conducted both the world première performance of his Second Violin Concerto played by Manoug Parikian and the first complete performance of his Second Symphony. The programme of the other broadcast concert which I attended at Studio 7 escapes my memory but I am sure it included performances of another two of Lloyd’s symphonies, maybe even one of those performed here. Lloyd stood on the podium with his striking mop of silver grey hair. I was struck by how competent he was conducting his own works. Several recordings I have on the Albany and Conifer labels bear this out for me. Nevertheless, on this Lyrita recording of the Sixth and Seventh Symphonies we are dealing with Edward Downes, a renowned conductor who should be in a different league than Lloyd. Downes had a long association with BBC Philharmonic and served as its principal conductor from 1980 to 1991. These Lyrita recordings are the first broadcast performances of the Sixth and Eighth Symphonies from 1979/1980. The orchestra was then named BBC Northern Symphony Orchestra. In 1982, it changed the name to the orchestra as we now know it. It is worth pointing out that these Lyrita recordings are part of the Lyrita/Richard Itter Broadcast Collection, from an archive of domestic recordings made by Richard Itter (Lyrita founder), from his Burnham home of BBC radio transmissions using state of the art equipment. The Lyrita Recorded Edition Trust put in place formal agreements with the BBC and the Musicians Union to permit the release to the public of items from the archive. The first work on the album, the Sixth Symphony from 1956, a three-movement score, is relatively short at just over twenty-two minutes. A stylish, compact work—it comes between two of Lloyd’s larger-scale symphonies—has a distinct Mendelssohnian appeal and emotional self-control to the writing. In the opening movement Allegro, a curious sense of near-anxiety is contrasted with lighter, more carefree writing; there is a memorable main theme. Warm and reassuring music lies on the surface of the Adagio, reminding me of a Tchaikovsky ballet. One soon realises that writing of a sad, yearning quality is never far away, yet it never becomes too profound. With the Mendelssohnian character in the Finale: Agitato it is easy to imagine lovers entering an enchanted forest inhabited by frolicking sprites and fairies in the manner of the incidental music to A Midsummer Night's Dream. The coda has an agreeable, festive, rather celebratory tone: an uplifting conclusion. Lloyd worked on the three-movement Seventh Symphony in 1957/1959 and orchestrated it some fifteen years later. It is known by the title “Proserpine”. Lloyd was influenced by the tale of the goddess, a daughter of Ceres and Jupiter, and actually prefaced the score with a quotation about Proserpine. Later Lloyd wrote that Proserpine “seems to tell us something about the human condition of having one foot on earth and another somewhere else—wherever that may be”. Marked Misterioso - Vivo ma leggiero, the opening movement feels eminently light-hearted, rather like the atmosphere of a country fair with writing especially dominated by the strings. Although a slightly unsettling undertow is discernible, it is not developed by the composer as one might expect. With a markedly aqueous character, the picturesque central movement Largo flows gently, easily evocative of a woodland stream. There are interruptions by woodwind figures suggesting the sounds of small animals and birds. Gusty conditions threaten to increase in the music but soon recede back to calm. Throughout both works, Downes’s readings feel firm and assured if slightly buttoned up in terms of emotional communication. The BBC Northern Symphony Orchestra is hard to fault. The playing is quite superb, fluent and consistent with considerable rhythmic buoyance. The sound quality of these BBC radio broadcasts recorded by Richard Itter is remarkable, exceptional in clarity and balance. There are a few minor extraneous noises which seem to come from the orchestra rather than radio signal interference. Paul Conway’s detailed essay in the booklet is first-class, both interesting and informative. 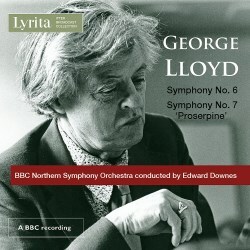 Several years after these Downes recordings were made, George Lloyd conducted his own recordings of both the Sixth and Seventh Symphonies with the BBC Philharmonic in 1988 (No. 6) and 1986 (No. 7). One can choose between Lloyd’s freer readings. They communicate emotional insights which feel heartfelt compared to Downes’s tighter, more cerebral interpretations which sometimes come across as bordering on the lacklustre. On balance, Lloyd’s own recordings, rather than Downes’s, make the most impact, and are beautifully played and recorded on Albany.